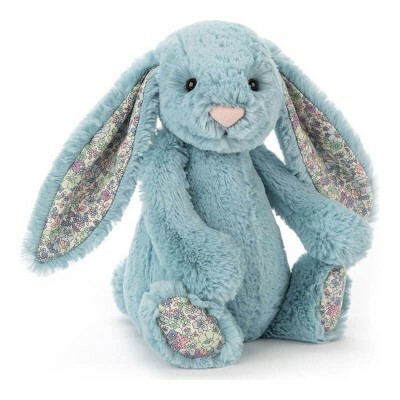 Once you feel how soft this Medium sized Jellycat Bashful Blossom Aqua Bunny is, you will know why Jellycat is one of the most popular plush rabbit toys around town for babies, kids and adults. With scrummy-soft, silky smooth Jellycat fur and long flopsy ears mean that with just one cuddle, you’ll never want to let go. Irresistibly cute and a perfect present for boys or girls. They'll want to take him everywhere! Everyone loves this cute little bunny. Spend a golden afternoon among the flowers with Blossom Aqua Bunny. This delightful water blossom is a wave of turquoise fluff, with sweet floral ears and feet that make them the perfect playmate.